Google has patented a system that would make a car “crumple” before impact to lessen the severity of a crash. The patent suggests ways to make panels on the car withdraw to soften the impact on a pedestrian or other object. Google suggests coupling the panels with sensor data to gauge the size of approaching objects and decide what action to take. The AA said many car makers were developing ways to reduce injuries caused by crashes. The US patent details several different ways to move bodywork panels on a car. One sees bumper sections of wings fixed using pins that can be broken by actuators on the car’s chassis. Immediately prior to impact the actuators would trigger, breaking the pins and making the panel pull back. Another approach suggests fixing panels to hinges or grooves so they can be pulled clear as an object is struck. 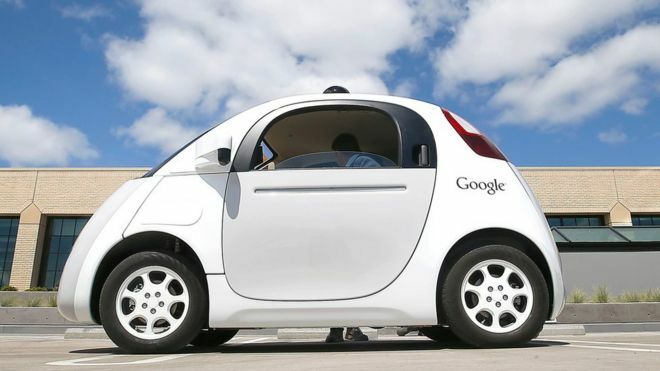 In its patent, Google said the system might prove useful when the driverless control system realises that an “impact with an object cannot be avoided by way of braking, steering, and/or accelerating the vehicle”. By making parts of the car move out of the way “the force of impact on the object which the vehicle collides may be reduced, thereby limiting the severity of injuries and/or damage to the object”. Data from sensors that help the car navigate could be used to assess the size and weight of an object to ensure the car’s bodywork took appropriate action, it said. 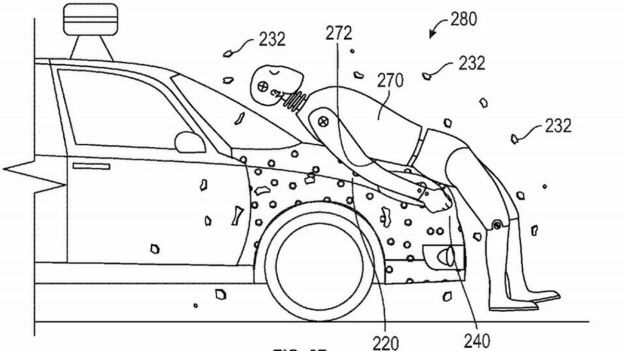 Last year, Google was granted a patent for a sticky coating that could catch people hit by the vehicle. A spokeswoman for the AA said some incidents, such as pedestrians running from between parked cars, happened too quickly for anyone, computers included, to react fast enough to stop an accident. Already, European NCAP tests have driven changes in materials used in bumpers, bonnet tops and wings to reduce the chance of vulnerable road users suffering severe injury, said the spokeswoman. Some cars now have pop-up bonnets that increased the distance between the bonnet surface and the hard parts of an engine that would cause more severe injuries if someone came into direct contact with them. Some manufacturers have also tried out airbags that spring out from the bottom of windscreens to cushion the impact between a car and a pedestrian or cyclist.